Verizon’s launch of the Samsung Droid Charge was limped somewhat when its 4G networks went down rapidly. But the re launch took place soon and now they’re selling it for $299.99 on a two year contract. This is considerably expensive given how other smartphones are priced at $199.99 (well most of them are). But given its 4G LTE capabilities, the company thinks that the pricing is justified . By now you must be wondering if there’s a discount on the Droid Charge. The answer is yes and again it’s Amazon that has swooped in and offered discounts to the customers disappointed with Verizon’s pricing. 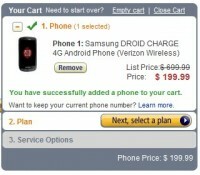 Amazon is now offering the Samsung Droid Charge for as low as $199.99 on a two year contract for new customers. And again new customers are being favored more because existing customers will have to shed out slightly more than them at $249.99, which is still a saving of $50 if you go by Verizon’s prices. It is really cool how Amazon manages to provide discounts on most heftily priced cellphones. If you wanted to get your hands on something like the Droid Charge but were taken aback by Verizon’s expensive prices, this is the deal for you. We highly recommend you to catch this deal. You can also look at similar deals with other smartphones that Amazon has to offer. The choices are endless really. The Droid Charge features a huge 4.3 inch display with a resolution of 480 x 800 pixels, an 8 MP camera on the back with a 1.3 MP front facing camera for video calls, LTE 4G capabilities, a 1 GHz single core Hummingbird processor and Android 2.2 Froyo.